Sweet Hawaiian rolls dipped in a mixture of buttermilk, egg, sugar and spice make a deliciously tangy version of classic French toast. Slice each roll in half horizontally (like a sandwich roll), then slice each half lengthwise to yield 4 pieces total. Trim any ragged edges to prevent burning. Whisk the egg, buttermilk, vanilla, sugar, cinnamon, salt and nutmeg together in a shallow dish. Heat 1 tablespoon of butter over medium heat in a nonstick pan. Working in 2 batches, coat the half the sticks in the egg mixture. Because the texture of these rolls is quite soft, work quickly to coat all sides without soaking. Place the sticks in the pan and fry, using tongs to turn frequently, until lightly crisped and golden brown on all sides. Drain on paper towels and set aside. Add the remaining tablespoon of butter to the pan and repeat the process with the second batch. Just before serving, dust lightly with powdered sugar. Serve with warm maple syrup for dipping. 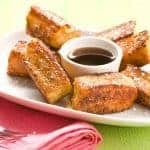 You may want to put finished French toast sticks in a warm oven (about 200°F) while you finish cooking subsequent batches, particularly if you are doubling the recipe.